Sierra Club Florida News: No More Nukes in Miami! This Thursday, the State of Florida will hold a public hearing on FPL’s proposal for a massive nuclear power plant expansion in Miami. FPL wants to cluster four nuclear reactors on Biscayne Bay at a cost of $25 billion dollars. This is a disaster waiting to happen if you do not speak up. This is your chance to be heard! When: Thursday, July 18th, 6:30 to 9:30 p.m.
Why: Nuclear expansion is dead in America. Only your voice can stop it in Miami and move this region to a sustainable future. Why not build more nuclear reactors in Miami? Cost prohibitive: FPL’s expansion would cost $25 billion. The extremely high cost is why America has moved away from nuclear. Nuclear Atlantis: Scientists have confirmed the area will be completely underwater due to sea level rise in a matter of decades. Non-renewable: There is no safe place to store the radioactive waste in an area to soon be underwater. Voracious thirst: Nuclear’s dirty secret is that it takes the water people need to live. Plentiful and safe alternatives: Solar power, on rooftops, warehouses and dedicated plants is plentiful and cheaper than nuclear. Deadly consequences: An accident from a direct hurricane strike, malfunction or human error could lead to catastrophe for millions of people. Fukishima also clustered its reactors on the edge of the sea. Nothing’s sacred: The reactor expansion is on the edge of Biscayne National Park and power line routes may be inside, on the edge of or just outside Everglades National Park. The plan also calls for massive wetland destruction. Waste dump: The plan calls for potentially-contaminated wastewater to be pumped into the ground and where it goes is anyone’s guess. 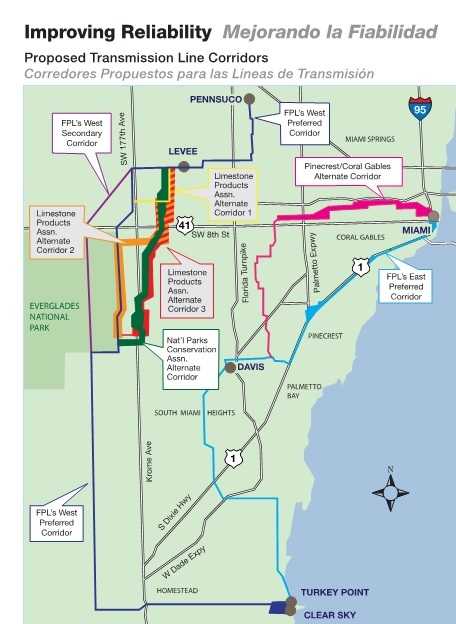 More dates for public comment sessions where you can speak up about Turkey Point Units 6 & 7 siting issues including the transmission corridors within Everglades National Park and along US1. Wednesday, July 17, 2013, 2:00 to 6:00 p.m. and 7:00 to 9:00 p.m.
Tuesday, July 23, 2013, 3:00 to 6:00 p.m. and 7:00 to 9:00 p.m.
Thursday, July 25, 2013, 6:30 p.m. to 9:00 p.m.